Dunwich is a place that my family like to visit in winter. Then, you can walk along the lonely shingle beneath the cliffs, with the wind coming in off the sea. It is easy to imagine that a whole town could disappear, for that is what happened here. It happened elsewhere along this coast as well, of course, and many churches were lost in villages from here to the Orwell. 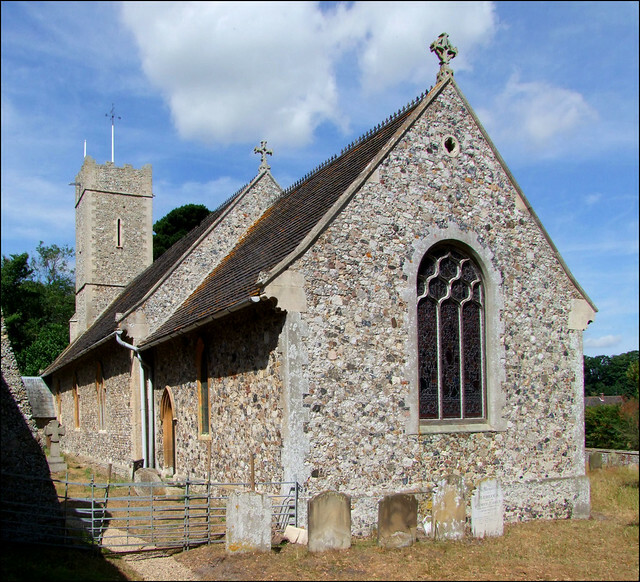 The difference with Dunwich is that it had six parish churches, as well as several other ex-parochial ones; these disappeared over the centuries one by one, until only All Saints was left, alone on a cliff top. It was only used for baptisms and funerals, and for nearly eighty years, Dunwich had no parish church at all; this, at a time when it was still electing two Members of Parliament! You can read the story of these churches, and their destruction, on the entry for All Saints. West of the church of All Saints, and outside the limits of the town, were the Greyfriars Monastery, and the leper hospital of St James. As a consequence, ruins of these two institutions survive today, and it was in the grounds of the leper hospital that the Diocese of Norwich built a new parish church for the area in 1832. It was in a grindingly classical style, quite out of keeping with all Suffolk tradition, despite the casual addition of a round tower. The architect was Robert Appleton. Few pictures of this church survive; over the next few years, the awakening of interest in ecclesiastical history, and the influence of the Oxford Movement, led to a complete transformation of the new church; by the 1860s, its tower had been replaced, and the body of the church encased in flint. To look at it today, one would never imagine that it had ever been anything else. In a county not renowned for its 19th century churches, St James is about as undistinguished as it is possible to be. It is pleasant enough, and has some interesting relics of its medieval forbears in the town, including a brass rescued from All Saints. But hardly exciting. However, I have never visited it without finding someone else looking around the church; it is a welcoming church, the signs and literature aware of the opportunities for evangelism in a tourist spot. I've never found this church locked. The 19th century interior is typically neat, and the glass is good. The plainness inherited from the 1832 church serves it well. Outside, the ruins of the leper chapel are now the Barne mausoleum, so you can't go in, which is a pity. But you can make out the liturgical apparatus at the east end. Don't miss the buttress rescued from All Saints; but perhaps the most remarkable thing in the churchyard is a cast iron pedestal and urn at the east end of the graveyard, almost certainly a product of the leiston ironworks. There is another nearby at Darsham.